The Occupy movement and the Arab Spring, together with uprisings elsewhere, have focused much theoretical thinking on insurrection and wherefore it leads. The basis of this essay is the idea of political reason and what ensues from it. It is based on ideas from Immanuel Kant’s critical philosophy. These ideas are examined and developed in the following posts: A critique of political reason part 1: Transcendental politics; Critique part 2: Practical political reason; and Critique part 3: Political constructivism. Apologies to those for whom this may be all too much effort and time to go through just to read this piece, but what follows will assume familiarity with key ideas in those posts, as well as some knowledge of Kant. The focus here is on the Kantian based notion of transcendental politics in terms of the concept of democracy, communism and other such ideas. 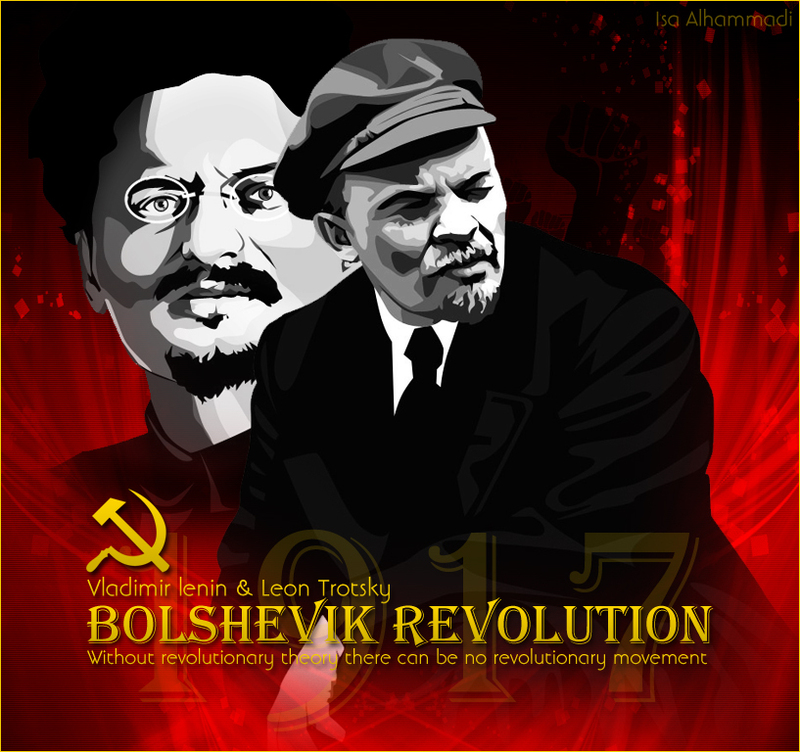 These ideas are examined through a reading of Leon Trotsky’s Terrorism and communism (Verso 2007) and V. I. Lenin’s State and revolution (The essential works of Lenin Dover 1987). We take the radical approach (as in the root cause) of showing that paradoxically while Marx, Engels, Lenin and Trotsky see their work as not based on the ideas of Kant and perhaps a departure from them (especially his moral imperatives), it will be apparent that the driving force for change in their revolutionary thinking as encapsulated in those two texts and beyond, show the opposite: That revolutionary theory that leads to communist ideals is driven by practical political reason. Practical political reason is grounded on morality. The latter underlies the ideas in Kant’s three critiques and it is also that which helps us understand better the apparent contradictions in a revolutionary force driven by seemingly utopian ideals, that yet calls for violence. The fuller development of this idea is seen in a discussion of some aspects of Alain Badiou’s The communist hypothesis (Verso 2010). This provides contemporary texts that help understand better the application of practical political reason: And it is this that underlies revolutionary theorizing or, as is termed here, revolutionary constructivism. The ideas extrapolated here may be rather shocking to Marxist purists and no doubt equally upsetting to Kantian ones: But they try to offer a coherent way to view the effect and force of Marxian and revolutionary ideas that despite their great insight in spurring one to action, have kept us limited within a 3D (three dimensional) framework of who should gain ascendancy over whom to make this a better world. But that approach inevitably keeps us locked into some form of conflict that tends to be sublated through violence: Yet it is possible to enact change without having to resort to it. We take a look at how the idea of democracy, as we have been indoctrinated to accept it, is no more than an obsession of our times and is a problem in that it works in tandem with capitalism and all the harm that brings us. We must be clear that democracy here is taken as representational democracy which comes under constant criticism in the Marxian critique, as it is seen as an extension and co-conspirator with capitalism. 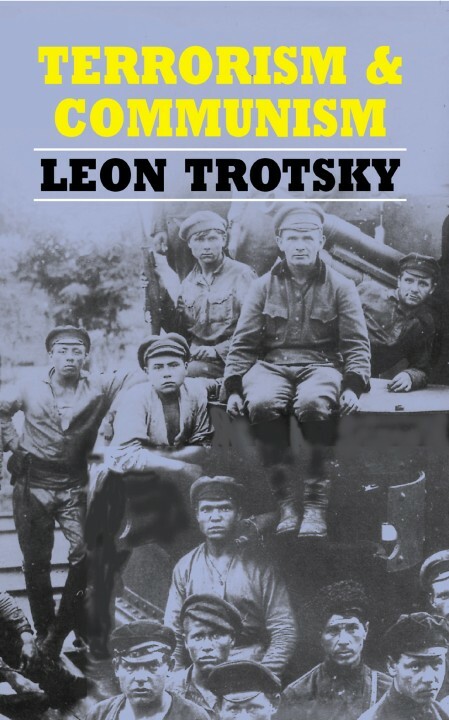 In this 1920 work Trotsky issues a vitriolic and sustained response to Karl Kautsky’s eponymous book which also examines the idea of democracy and the proposed replacement of it by a dictatorship of the proletariat. Trotsky mentions Kant in a derisive manner reflective of his attack mode on Kautsky, and so he presents a limited view of Kant. Kautsky’s own understanding of Kant is a garden variety type which does not reflect the full range, depth, subtlety and force of his ideas, particularly those found in the critiques. But paradoxically, it is indeed the ideas of Kant that provide the analytical tools to examine with consistency the ideas that develop from Trotsky contra Kautsky. Trotsky attacks early on Kautsky’s obsession with the form and perceived niceties of democracy when Russia was burning from civil strife just after the end of Word War I; a bloody conflict that even saw imperialist forces like America trying to interfere on the side of capitalism. Trotsky points out that pleasantries in the course of revolution and civil war are not always possible, and that Kautsky misses the point by insisting not on the establishment of a system of government in favour of the masses as opposed to the capitalists (which was what the Russian revolution was about), but on why formalities like national elections and “the counting of votes…by the capitalist tellers of parliamentarism” (Trotsky 21) are not carried out. Trotsky emphasizes the ideological slant of Kautsky’s democratism in the latter’s insistence, like all those who think democracy offers genuine choice and freedom, that democracy is the way to go; and that never mind the “problem is for the ruling imperialist bandits to succeed…to deceive, violate and swindle public opinion, by collecting 51 per cent of the votes against your 49. Perish the world, but long live the parliamentary majority!” (Trotsky 22). Indeed, so many today still believe that voting regularly for different versions of the same representatives of capitalism (or characters of representative democracy) somehow means we are free. Trotsky brings into further relief the silliness of the idea that the will of the majority of voters must inevitably reflect what is right. For while Kautsky laments that a dictatorship of the proletariat is that of a minority over a majority, it belies the reality of a bourgeois dictatorship of the exploiters over everyone “masked by forms of democracy” (Trotsky 24). He continues that the obsession with getting 51% of the votes is sheer “fetishism of the parliamentary majority” that is a “brutal repudiation” of any revolutionary attempts to set things right. The reality, as Trotsky points out, is that it is class interests that are embodied in democracy despite the delusional denial by many. Laws in a democratic state regularly promote violence by those who have all the advantages of society, against those who lack so much in life – this reveals that democracies are often quite oppressive, repressive and suppressive irrespective of how they are sugarcoated by ideologues. While Trotsky is right to say Kautsky submits to a metaphysics for democracy as he makes it a transcendent idea and treats it as a thing-in-itself, he ironically gives a Kantian critique of his nemesis: For that is precisely what Kant would say, in that any metaphysical claims and reliance on things-in-themselves are not only baseless, but tend towards dogmatism. This is an impressive expression of many things by Trotsky. In it he develops the idea of democracy being transformed from a transcendental concept into a fetishized transcendent one. He also highlights that because of resistance to the idea of socialism in the context of so-called democracies, conflict is inevitable. Not that the masses seek it, but the bosses that run democracy see to it that a fight to the death is necessary before there is some semblance of justice in society. But most importantly, Trotsky accurately states that the transcendent-mystical idea of democracy is an idealized vision that has no bearing to Realpolitik: That is, one can believe in the cuteness of teddy bears but the society that extols such beliefs does not then automatically promote cuddly love among its populace. Democracy is but a farce and its proponents may not always be aware that their efforts at giving divine status to the term, only aggravates the injustice it engenders for all: Inclusive of the many who blithely extol it. For Trotsky, it is this transcendent assertion of what democracy is — happily championed by Kautsky as “absolute and eternal” (Trotsky 43) — that is at odds with creating the basis for a practicable socialism that would help lead the Bolsheviks in creating a workable system to enact some form of ideals that could lead to communism. In short, this practical approach would clash with the transcendent mysticism of that perfect (Platonic) idea: Democracy. The practical approach of doing what is right to the best of one’s ability, which is what Trotsky is suggesting his idea of socialism is about, counters the static and fatalistic approach of blind faith and dogmatism in a transcendent democracy. He wants to go beyond the metaphysical limitations of Kautsky’s “idealist philosophy” and obsession with things as an “end-in-itself” (Trotsky 63) which underlies transcendent democracy. Here Trotsky offers the dictatorship of the proletariat as representing the PPR (practical political reason) that underlies serving the interests of the masses which is at odds with iniquities resulting from the assumed positive value of a transcendent democracy. Trotsky offers a minority group working for the well being of the majority that goes beyond the belief in mystical notions of democracy and is based on trying, imperfect though it may be, to rectify societal imbalances. It is hoped that this can be partly achieved by the use throughout the country of soviets (councils) that will represent the interests of the people. It is meant to be the antithesis of parliamentary politics and its fractious vying for power. The system of constructivism here, however, while driven by PPR to do what is for the good of all becomes Trotsky and his party’s synthetic theorization of what the soviet and communist system should be. This theorization would include how grassroots decision making occurs as manifested via the soviet system (designed as councils that develop out of statist control). Thus, the reasoning here is an example of the transcendental logic used to process the Marxian idea of the withering away of the state that should be a result of the soviet form of government: It is about modalities that can be achieved with the right conditions. This contrasts starkly with transcendent democracy which no one knows what it is though everyone acts as if they do know what it means; it is an empty term bandied about as many claim that it makes people supposedly ‘free’ and ‘equal’ (though some may argue that it has its own form of theorizing rationalizing it, but that would also be to make it consistent with capitalist theorizing which would then bring it back to the same clash in conception with the Marxian critique). The theorizing continues to rationalize the role of the communist party as part of the dictatorship of the proletariat which underwrites the soviet system that allows for the constructivism of its own democratic processes. These replace the theorizing of parliamentary/capitalist democracy and oppose the mystical conception of democracy itself. The original Bolshevik revolutionaries avoided transcendent claims about communism as they did not see it as an idealization and thing-in-itself, though they did at various times seem to make it a goal, and thereby qualifying some of their revolutionary efforts as heteronomous. This will be looked at further. The constructivist approach taken by Trotsky and his generation in accordance to Marxian principles, where the dialectics of the situation saw attempts to resolve problems, were such that they “had to find the solution in practice, and test it in practice.” (Trotsky 124-125). This goes beyond asserting the transcendent good that is supposed to pop out of an idealized concept like democracy. This revolutionary practice is re-cast in this discussion to show that in actuality, Marxian revolutionary praxis is an attempt at working towards something that has not been established specifically. It is meant to be a process where communism should not be an end goal. In order for this practice and concept to be rescued and understood properly today, it must be shown not to be goal-centric and thereby heteronomous. Whereas, in the case of democracy and its proponents, it is gleefully assumed that it is already being practised by states the way it is meant to be (for example, the US and UK claim to be actual democracies). Democracy is also a perfect-transcendent Idea and, thus, mystical — since no one knows what exactly this perfect idea is. But some seem to apparently recognize it when appearing in the form of certain Western states: This smacks of inconsistency at best, circularity at worst, but with harmful effects on life forms as a result. 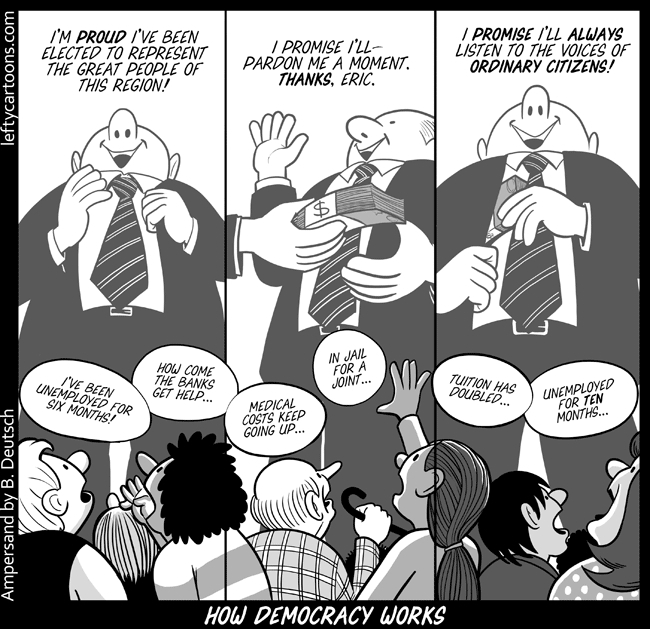 Moreover, apparently just mentioning ‘democracy’ is to mention a good thing – which is an infantile and dangerous fetish in most cases as we have seen in our time: Democracy’s rogue state actions of war, torture, phenomenal indebtedness, vicious income inequalities, and savage socio-economic policies inflicted on the vulnerable, etc. Asserting that democracy is a good-thing-in-itself/transcendent Idea, and that it is being practised with shameless circularity as an example of a good-thing-in-itself, enhances its heteronomous nature, as democracies have to try and show that they are at all times representing this good-thing-in-itself and therefore, cannot evolve or change for the better — since they are already in a state of grace and perfection (or close to it). Such ludicrous suppositions about democracy are still held sacrosanct. They are static examples of supposed political beauty (but tempered by a great deal of violent ugliness). Democracy as we know it is something to be aimed for as an end-goal-in-itself (reflecting its ascribed transcendent status): This implies everything is a means to the end of achieving and maintaining that goal (democracy). It is utilitarianism in a most brutal form. It is alright to torture and kill in the name of democracy, to ‘spread’ it and to materialize it all over the world and in every single state if possible. For the purveyors of democracy it is about preserving the unconscionable status quo of their ascendancy over all else: This is something to be sustained by any means necessary. In fact, there are no possibilities that can be allowed because all can be static perfection when it finally reflects the transcendent perfect Idea of democracy-in-the-world. This is the hallmark of fundamentalist type thinking that democracies pretend to be against. It is about absolute conformism. Democracy is the new fundamentalism. But if we are sure that another and better world is possible, then it is not going to be democracy. Here labour is merged as part of a unified theory of the soviet and the party to form a unique system of governance that is in contradistinction to democracy; it highlights the activism involved in the process of such a set-up as opposed to elected representatives playing games in trying to gain popularity so as to end up attempting to control a bureaucracy — and with which they then surrender the state to capitalist forces; all the while short-changing those whose interests they are supposed to protect (the people). It is at this point that Trotsky relents and uses the ‘m’ word (morality) for that is the one thing that consistently separates the purveyors of transcendent mystical democracy and those trying to bring fairness to everyone and move beyond exploitation: It is here that we learn that the chief “of our resource is moral influence – propaganda not only in word but in deed” (Trotsky 138). For PPR and the moral force behind it will drive us to do that which makes us worthy of happiness, and that would be to give expression to morality in action. In other words, the underlying basis of the revolutionary drive is a moral one reflective of its spiritual strength. 1. The concentration of production and capital developed to such a stage that it creates monopolies which play a decisive role in economic life. 2. The merging of bank capital with industrial capital, and the creation, on the basis of ‘finance capital,’ of a financial oligarchy. 3. 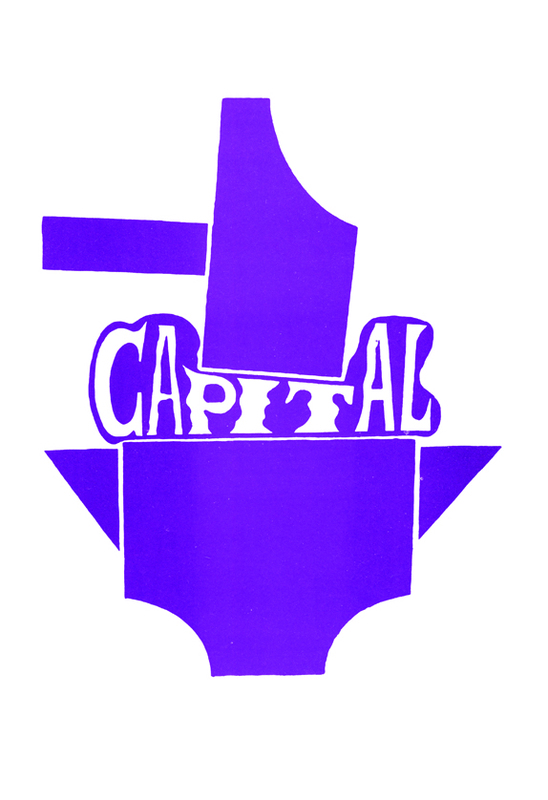 The export of capital, which has become extremely important, as distinguished from the export of commodities. 4. The formation of international capitalist monopolies which share the world among themselves. We only need look at the world today to see how prophetic Lenin’s words are in describing the virtual control of the planet by capitalist forces. What is still not clear to many today, however, is that the most rascally elements of capitalism are effectively the ideologues of democracy, and this includes those states that meretriciously refer to themselves as democracies. In essence, democracies as we know them today are but high end feudal states that are still the domain of the bourgeoisie. And what Lenin points out, in State and revolution, as salient to us today is that while “the forms of the bourgeois state are extremely varied, but in essence they are all the same: in one way or another, in the last analysis, all these states are inevitably the dictatorship of the bourgeoisie” (Lenin 295, italics in quotes are his). Which is why both he and Trotsky are strident about the need to counter this with the ‘dictatorship of the proletariat’: For before any transition can be made into any workable situation in preparation for communism, control has to be wrested from the capitalist triumphalists. This shows the constructivist approach Lenin always uses and highlights in his exegesis and application of Marx’s ideas to almost any situation he confronts. It is constructivist in building revolutionary principles and modes of action based on what is learnt from the ground. These principles are then generally agreed upon by a community based on an overlapping consensus of what they believe resonates with their moral sense as well as its practicability. It is also subject to change when necessary and is thus fluid in nature. Here Lenin brings into relief the PPR of having the commune not as an end in itself, but as that resulting from an act of doing something to be worthy of happiness: This is what merges the fervour of the human spirit with revolutionary aspirations in creating a world fair and just for everyone, despite the difficulties that ensue. Lenin extends the synthetic theorizing of Marx and Engels through the commune to the point in history where he found himself just before the Russian Revolution. That the commune was an entity that opened up the possibility of something new in the expression of popular consciousness is emphasized by Lenin, as it prepares the way for the process of making the apparatus of the state redundant. Here Lenin describes part of the constructivist move where there is a paradigm shift which facilitates activity that leads to being weaned off the state. But he is also assuming a shift in consciousness out of class and false consciousness towards a unity consciousness. This in itself is an act of liberation for the masses. Here through PPR and doing what is for the highest good of all we have a move towards a so-called ‘pure’ democracy (not the transcendent concept of Kautsky and proponents of capitalism-democracy); it is a by-product of the moral drive underlying Kantian political constructivism. It is part of Marxian theorizing that allows for a historical progression of capitalism-democracy to socialism, etc. In this dialectical progression, Lenin implies that a kind of ‘pure’ democracy, as a stage of state-in-transition to socialism, should occur prior to the withering away of state structures/apparatus together with said democracy. This is almost a representation of returning back (on a higher paradigm due to dialectics) to an original state of rectitude and moral vision. This will automatically lead to falling away of confining and punishing entities like the state as the transition to socialism is complete, and the pathway is open to communism. Lenin goes to say that doing what is right will be cast as utopian by bourgeoisie who are aligned to the selfish attitudes of capitalism. They also raises doubts as to how such thinking could ever result in material commodities being provided for anyone. But such limited mindsets for the self-serving do not deter Lenin and revolutionaries like him. It is in extending the idea of PPR and its underlying moral vision and drive that allows for the paradigm shift of seeing people doing what many think they are unable to do: Cooperate, collaborate and work together productively. Most importantly, it opens up the space for humans to grow and experiment with possibilities. Modalities open up based on changes in technology, the current economic and environmental crises and the will of the human race to improve and nurture life on the planet that has always been a natural expression of our species. This moral drive of PPR through revolutionary ideas where people co-create a world reflecting interests for the highest good of all and the planet can be termed revolutionary constructivism. the remnants of the old surviving in the new confront us in life at every step, in nature as well as society, Marx…indicated what is economically and politically inevitable in the society which is emerging from the womb of capitalism. The entire constructivist process of PPR is a flow that opens up the space to progress towards realizing aspects of communism. It is clearly an evolutionary activity; it grows out dialectically from democracy as part of a historical process. But the agents of change are human beings who challenge the status quo to co-create their reality by realizing their revolutionary consciousness via revolutionary constructivism. The process of progressing along this path of revolutionary consciousness is mentioned by Lenin again — “the overthrow of the exploiters, is by no means our ideal, or our ultimate goal. 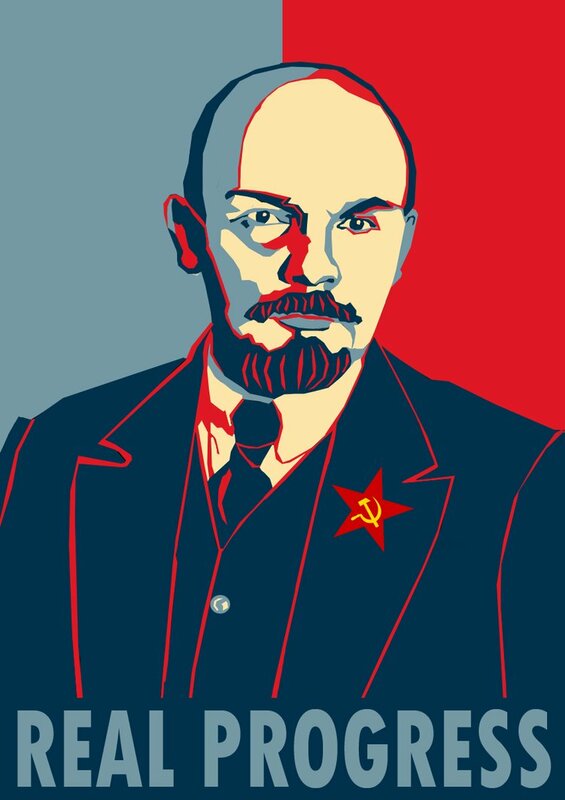 It is but a necessary step for the purpose of thoroughly purging society of all hideousness and foulness of capitalist exploitation, and for the purpose of advancing further” (Lenin 348). He correctly points out that the process of revolutionary political construction/revolutionary constructivism (revcon) is to go beyond fixed goals such as the overthrow of the bourgeoisie (though that may happen along the way) – so this would avoid heteronomy, but enhance autonomy which is grounded in morality. Ultimately, it is about doing what is right for the highest good of all that should guide us in our social evolution. And so, Lenin adds that such an approach involving the empowerment of each person will finally see the “door…wide open for the transition from the first phase of communist society to its higher phase, and with it to the complete withering away of the state” (Lenin 349). Thus, his theorization is sublated by the open portal of possibilities that revcon gives us here in the case of growing into the potential of realizing aspects of communism. When aspects of communism are referred to it does not mean that there are fixed qualities/concepts like egalitarianism and shared abundance that must be enacted as we understand them at this moment, but it will be a creative solution that in a particular context in time, will be acceptable and understood by people as being the best and fairest way of, for instance, pooling and sharing of resources. This is not a fixed situation where things are cast in stone and thereby permanent. The concepts may be universal but not eternal transcendent imaginings; they are acceptable and resonate with our moral drives and so formulated and practised for the highest welfare of all: They are subject to change and can evolve. Therefore, revcon shows that creative solutions that emanate from it are always open to change and so it is quite impossible to see what the end goal will be other than that it will be in the highest and most decent interest of all. This is an expression of our autonomy. Hence, among the key reasons for the eventual failure of the Bolshevik and other revolutions is the shift away from revcon that was the driving impetus, and towards the heteronomy of goal-setting: That may be suitable for management practices but it is not helpful for revolutions. The attempt to set a goal and proclaim ‘socialism in one country’ (as Stalin did) and claim the goal of communism has been achieved, or for countries like China to claim they are communist (when they are obviously not) — makes communism an end goal/transcendent, and thereby heteronomous. This sets in place specific targets and markers that result in severe cutting of corners due to expediency and violence in the attempt to achieve fixed goals that ultimately destroy any revolutionary project. Coupled with this is the issue of sustainability and a limited shift in consciousness of people (as opposed to a mass shift) who support, or are empathetic, to revolutionary change. In any case, the Stalinist takeover of the Bolshevik project led to the removal of all autonomy and its moral drive, and thus all that underpins revcon. So it is no surprise that the USSR turned into a totalitarian state.  In both the case of the USSR and China, they had become statist by relinquishing revcon and waddling into the backward and winding path of state controlled capitalism and, eventually, pseudo-capitalism but with a red star on their caps. The USSR ineluctably fell apart and China is holding a fractious populace with a seemingly overheated economy of inflated figures and fictitious capital giving the semblance of actual growth and progress. What they are still adept at is information blackouts and repression, as well as holding onto empty IOUs from the US which in turn is backed by a currency that is bereft of any genuine value. However, also re-looking the ideas of revolution, communism, failure and utopianism is largely the task for Badiou’s collection of essays, The communist hypothesis (for convenience, page references will be given without stating each time the name of the article it is from). Essentially, constructing revolutionary ideas within the context of their time was not only what Marx and Engels were doing, but in dramatic and urgent form – what Lenin and Trotsky engaged in. Badiou tries to provide a meaningful context to extend and make useful again, the discourse and action of revolution. As will be seen, the effort is laudable but does not offer a way forward as such though it does help ongoing efforts to open a space for continued revolutionary activity. While this may suffice for Badiou’s purposes the idea of PPR and revcon show a clearer way to proceed through this space: In fact, this is already happening with the Occupy movement and the uprisings in the Middle East and Europe. Badiou also provides a helpful set of ideas to contrast against in clarifying and projecting forward the notion of revcon. Badiou relies on a Platonic/idealized conception of communism in that it is an Idea to be striven for and attained. And so, like Kautsky who made transcendent the transcendental idea of democracy, Badiou ironically does the same for communism. He does what Marx, Engels, Lenin and Trotsky (the Quartet) studiously avoid. Yet making transcendent the transcendental concept of communism also allows us then to move forward through learning from it. One could even argue for its dialectical and historical necessity. 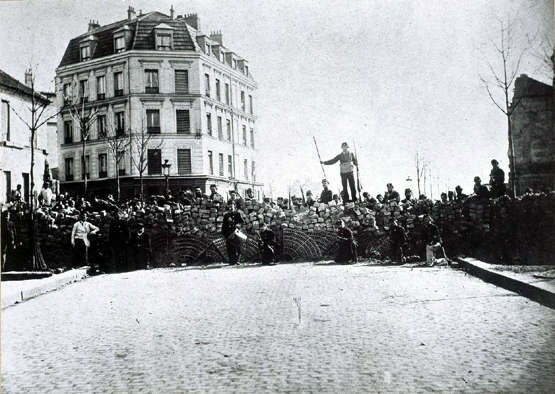 And learning from what does not work historically is something Badiou points out as crucial in what we need to do to avoid again the apparent failures of the Paris commune, the protests of May 1968 and Mao’s Cultural Revolution. 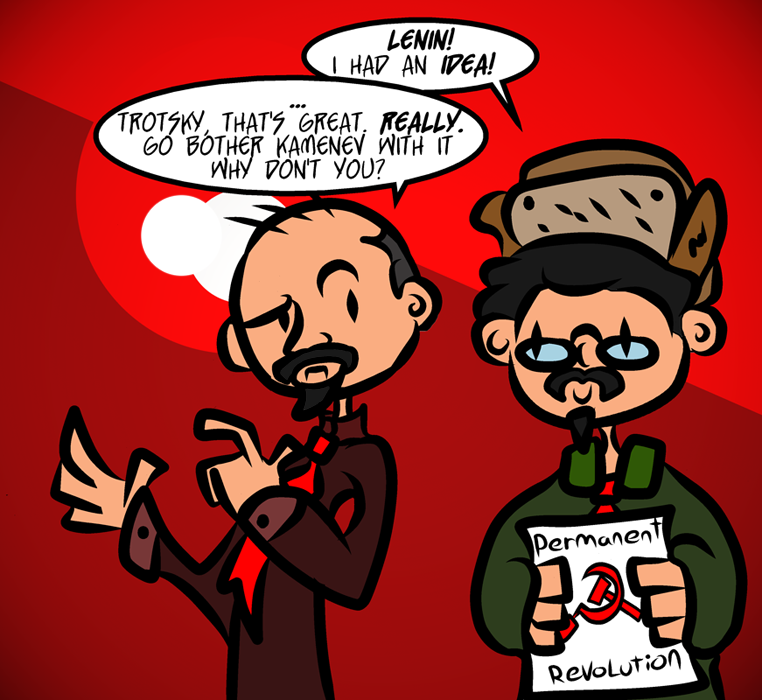 Lenin and Trotsky did their own re-examination of their failures and also mentioned in their later work that while ideas of revolution and communism would always be valid, they are not utopian at all (in that they could be realized as part of a process). For those supporting the ideas of the Quartet and trying to take it to a higher paradigm, they would be actively working out how to avoid repeating ‘mistakes’ and the failure of the Bolshevik revolution, the rise of Stalinism, and the unsustainability of the USSR. China, of course, is anything but communist; but then the only communism we have known is the capitalized version of it. And the question that arises currently with the manifestly failing capitalist system: Is revolutionary change needed again with a move towards communism; this, Badiou encourages (and the Quartet would agree with). Or is it that we need revolutionary change irrespective of whether an end-goal called communism is achieved – which is where we find ourselves today in terms of Occupy and peoples’ uprisings and what revcon implies (which is also consistent with the Quartet’s vision). Hopefully, it will be made clear that the process of revolutionary change happening around us tends to avoid aiming for an end-goal (for Badiou, it is communism); rather, it goes with the flow of revcon which eventually brings in the ideals championed by communism as it develops. Badiou though arguing for an end goal of communism, sometimes thinks he is making the case for the latter and so at the same time espouses an open ended striving (which is somehow also goal-centric on the Idea of communism). To be fair, this probably comes about due to clasping a set of past essays together bookended with a couple of new ones to help rationalize all of it: And so this is what we have as Badiou’s version presently of what it is to bring communism into reality today. Badiou points out early, that there are always the same issues encountered when enunciating the case for communism in that the typical objections against communism have been that it is utopian and unviable no matter what. Badiou argues that there is nothing fixed about the communist vision as it is a process that opens up creative spaces such that we can (all italics in quotes that follow are Badiou’s) “speak of a space of possible failures. And it is within that space that a failure invites us to seek and to theorize the point at which we are now forbidden to fail” (Badiou 40). The so-called failures in the communist enterprise, the most glaring being the final outcome of the Bolshevik revolution of 1917 (which Lenin and Trotsky started to sense in the 1920s), have nothing to do with invalidating the ideals associated with them. Nor would such failures ever cancel the possibility of ideals being realized: This is a crucial point that will be examined further. What Badiou is suggesting is that we move away from just the criticism of the system that is the strength of the Marxian critique and start examining the opening up of possibilities in constructing a new reality. Badiou is interested in showing that in order to promote the communist idea we must also have the courage to support it. He grips on to the need to still be a contemporary of May 1968. He formulates the communist idea as aimed for by the hypothesis as a transcendent one. He then insists that “we have to live with an idea, and that what deserves to be called a real politics begins with that conviction” (Badiou 67). And so begins the fetishization of the communist idea. But Badiou does see the 1871 commune as a rupture from the traditional ideas/mindset of the left that helps prevent its calcification into ‘Leftism’, however temporary the effect may be. He sees the commune as an idea to be attained again in our timeline and not something to be reclaimed and hegemonized by tamed parliamentary leftists who are compromisers with capitalism (Badiou 198-199). He then gives the commune a special and mystical status, and states that the commune is a site and thereby a singularity. A few lines before this Badiou refers to the site as “transcendental” in a non- Kantian sense. And its connection to its being-ness gives it an ontological status that makes it transcendent. Badiou’s strategy is to give strength to his communist Idea by rendering it a Platonic one that is eternal, and can be invoked in any timeline to be attained/materialized. He does this again with the commune which is idealized and is, thus, ahistorical (it re-emerges again as May 1968 according to Badiou). 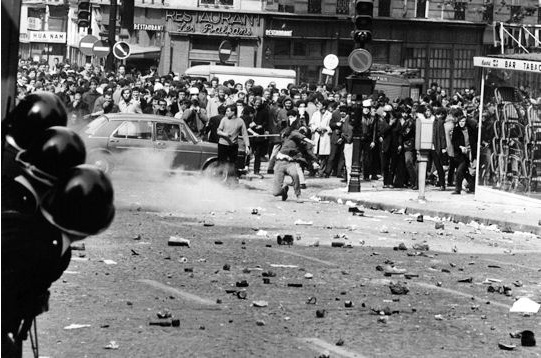 Yet, the commune and May 1968 are seen as ruptures that are colonized anaemically by leftists who corrupt it into a typical aspect of the politics of the day. This suggests they are desecrating the transcendent-mystical quality of these idealized entities. However, Badiou does use the term ‘transcendental’ accurately in the Kantian sense a little later as he tries to explicate his transcendent-ontological idea of the commune when he says, “…we have a divided world whose logical organization – what in philosophical jargon could be called its transcendental organization – reconciles intensities of political existence according to two sets of antagonistic criteria” (Badiou 202). In this context, with due synthetic theorizing, he uses the ideas of the two opposing camps of the reactionaries of the National Assembly of 1871, and the Parisian workers forming the commune — as a surface representation of the deeper ontological reality of the commune-as-rupture. Badiou seems to say that his theorizing is shaped by the seeping of the transcendent into the transcendental theorizing (“transcendental evaluation”) which reflects not just the essence of its transcendence (“ontological particularity”) but also what follows from this, that is, the transcendental logic of his theory (“logical unfolding”). However, it becomes apparent in all such transcendent-ontology based/ metaphysical theorizing: That what issues forth may be interesting, but tends to obscure as it inclines towards circularity; and so it returns to the indefinable essence that was supposed to be the base from which the transcendental theorizing is jettisoned — that is, the transcendent-ontological term which is never clear itself and is a form of mysticism (for Badiou it would include communism, commune, worker-being, etc). Then for a number of pages Badiou expatiates on his idea of transcendent-ontological singularity as a site of differing intensities that appear and disappear and which, unfortunately, serves to obfuscate even further rather than enlighten (Badiou 209-228). In essence, he is trapped within his theorizing by using transcendent-ontologisms to account for the historical events of 1871. To confuse matters, he uses quantum physics as a metaphor (though not stating so explicitly), as he has singularities and events that start off strong and then fade in and out of existence depending on various influences and interventions. The discussion becomes a veritable Bermuda triangle of singularities morphing and vanishing as mysteriously as they appear replicating supposed characteristics of subatomic particles. In the end, at the heart of Badiou’s mystery is just a transcendent-ontologism. No one can say for sure what the essence (or as Kant would say, noumenon) exactly is from which this singularity of the 1871 commune bursts out from only to be hegemonized by the politics of the day. However, the rupture of events like the commune can be said to open up possibilities. Indeed, a great deal of quantum physics does depend on possibilities rather than certainties (e.g. the Heisenberg Uncertainty Principle); but it also depends on perception and the presence of consciousness that can change the way events take place. Badiou is on the threshold of making some valuable insights but prefers the traditional approach of stating that ruptures open up possibilities – but we know this. He falls short of showing us that there must be a basis for bringing about change that is powerful enough to not only capture the hearts and minds of human beings but show that we act with moral force. The outbreak of war is also a rupture, and it too opens up myriad possibilities but that does not show us how we should then lead our lives in that context other than survival. If there are moral dimensions involved in these ruptures then what are they and how are they accounted for. In other words, ruptures like the commune open up the possibility for change that have, for Badiou, an unstated moral dimension. This becomes clearer when he claims that the rupture of the commune is a break from the politics of the left, and from “the representative form of politics”, or “a rupture with ‘democracy’” (Badiou 227). For surely, there is a good that is ascribed to this rupture that supposedly takes us away from the stultifying and corrupt politics of our time: Hence, Badiou constantly flirts with an unstated moral dimension. The idea of a transcendent communism as an Idea acting itself out through people is given further expression as that which is ahistorical enacting itself historically in specific contexts and as events in a linear timeline. Platonic Ideas come into play and interject historically so that an event where people meet to improve things within a social context becomes an idealized representation in which it is “visible that ‘just ideas’ come from…practically invisible practice” (Badiou 254-255). Instead of the co-creation of reality through revcon, we have the Transcendent imposing itself as a mystical presence that, in effect, hinders agency and is effectively heteronomous: It is that which demands reliance on its transcendence rather than instigating freedom. We are not motivated, but in actuality shackled to an Idea. It is intellectual slavery. We further learn that “the communist Idea today…is that the withering away of the State, while undoubtedly a principle that must be apparent in any political action…is also an infinite task, since the creation of new political truths will always shift the dividing line between Statist, hence historical, facts and the eternal consequences of an event” (Badiou 256-257). This turns out to be a process rather than something that can be contained by a Socialist state or party. The interventions in the form of the commune, May 1968 or the Cultural Revolution are appropriate historical progressions of the Idea of communism. To Badiou, this process is another way of representing the communist hypothesis. This then combines “intellectual constructs, which are always global and universal, with experiments of fragments of truths, which are local and singular, yet universally transmittable, [so] we can give new life to the communist hypothesis, or rather to the Idea of communism, in individual consciousnesses” (Badiou 260). This expression, however, is arguably effectively re-formulated and encapsulated by revcon which shows a way forward that is descriptive and prescriptive. This genuinely opens up the space for possibilities that may help us understand better “a political process ‘without a party’” (Badiou 279) that can be seen in the Arab uprisings, Occupy and the Eurozone protests. Both PPR and revcon are concepts that allow for a coherent explanation of the revolutionary ideas of Marx, Engels, Lenin and Trotsky (the Quartet), among others. The practical, and thereby, morally driven ideas of the Quartet are a reflection of developing working socio-economic-political principles from the ground up. This creation of a new societal paradigm to supersede capitalism is an expression of synthetic theorizing that forms the basis of radical thinking. The revcon of the Quartet as seen particularly through Lenin and Trotsky’s ideas always has reference to the moral and spiritual basis of things; granted that religion is not promoted, but a broad based spirituality is inherent in all attempts to do what is in the highest good for all: This is clearly in contrast to the amoral and immoral utilitarian tenets of capitalism-democracy. The Quartet, and even Badiou, argue that democracy as we know it is aligned inevitably to that which is never in the highest good of anyone for its systemic utilitarian nature of the ends justify the means is devoid of moral interest, and is thereby heteronomous (the goal is a service-to-self ideology, greed, sensual gratification at the expense of all else, etc). Kautsky’s stance on democracy and his absurdist notions of a democratic-socialism are what is symptomatic of ever failing limp-wristed attempts at a left-wing resurgence. Many leftists today are proponents of an adulterated capitalism-democracy. Badiou also decries the left-wing phenomena of today as not being focused on revolution so much as trying to gain parliamentary respectability. The quest for electability of the left-wing is not to enact a revolutionary agenda of change, but rather present an anodyne version of what would hardly even qualify as being a simulation of the highest good of all, that is, a static alternative to other parties that have been compromised and corrupted by capital: A classic example are many so-called labour parties. Kautskyism is what best describes the socialist trend of today: That which is reflective of capitalist-democracy with a slight flavouring of leftism. There is a lack of even trying to educate people on revolutionary ideas and so at least help forge an evolutionary adjustment that could lead to a situation that brings about genuine change. What we have are the epigones pretending to act for the good of the people, while all the while being subservient to capital, its controllers and the state apparatus; they seem more interested in bringing about limited or calibrated variations to the status quo. But as discussed, the Idea of democracy as epitomized by Kautsky is a transcendent one — in that it becomes not only mystical/eternal, it is also heteronomous and is an imposition on people. It is the imposing of a fixed Idea, which becomes an idée fixe without any form of ethical creative expression or content, on people that helps undermine the good of all. For instance, what is considered democracy is that which is forced on states and peoples in that there needs to be some variation of: Two major political parties, or multiple political parties serving their own interest; fractious and gridlocked government; one party state and a calcified bureaucracy with limited democratic practices; lobby groups running wild; socio-economic-political control exerted by corporations and banks; waging war in the interest of capital, etc. The heteronomous transcendent Idea of democracy counters the exercise of free will in a manner that disallows people to achieve their highest potential (other than elites who attain this at the expense of all other life forms). For instance, the democracy practised by the USA is one that has been hegemonized by capitalism. So we have a democracy that favours the rich, has almost wiped out its middle class, has increased the size of its low wage class, and is an engine for growing unemployment. It spreads democracy to other states by violence. So it is not only in the thrall of globalization, but engages in war and promotes conflict whenever it can. It encourages the torture of people, and has tried to morph into a police state and increases acts of violence against its populace (particularly the vulnerable and those at the lower end of the food chain). This kind of democracy as evinced by America is a good example of the transcendent Idea of democracy at work in our timeline. For all one has to do is just keep repeating the mantra — ‘we are a democracy’, and you thus have a democracy (in fact, a representative one, and not a direct democracy). There is also a surrender of autonomy to elected representatives who create laws and expect people to abide by them despite said laws being against the interests of many people: Such as promulgating ‘anti-terror’ laws which are fear based and allow the eroding of any vestiges of ‘freedom’, and encourage expenditure of resources to facilitate the repressive state apparatus. National resources and that of the people are squandered on bailing out criminal organizations like big banks and businesses and the mafioso who run it. The purpose of American democracy is to give breaks for the wealthy minority and increase burdens in any way possible on the majority of citizens: This is the high water mark of democracy today and it is where what is left of human dignity starts to drown. The bottom line is that democracy is the anodyne version of fascism. The transcendent mystical idea of it as being a thing-in-itself, a good-in-itself, a specific representation of the noumenon like a huge polished slab of gold — is precisely the kind of heteronomy generating notion that makes the Idea of the Hitlerian volk a transcendent and harmful obfuscation. One is dependent on the Idea of democracy and the purpose is to blindly strive within the process of wealth/capital accumulation to materialize at all costs a gargantuan monument to Mammon standing in the centre of each capital city of the world. Which is why Badiou’s well-intentioned but ill-conceived notion of communism is surprising in that it is the left-wing transcendent fetishzation that the rightists are guilty of with their capitalism-democracy-statism. The communist hypothesis may help indicate in some way that another world is possible. However, Badiou points out that despite this hypothesis we are prisoners in the conviction that there is no way out, and no emancipatory politics is possible. We are caught in this aporia between intellectualism and the desire to act. This seeming impasse is reflected in the rest of Badiou’s theorizing that appears to claim that at any moment in the understanding/grasping of the Idea of communism, there may be a breakthrough in the form of historical representation of the ahistoricality of his metaphysics; a metaphysics which subscribes to there being an ontology to communism. Yet he claims when initiating the idea of the hypothesis (Badiou 63-64) that it is more about stating what is not necessary (the status quo) than what is possible as an alternative. He follows this with stating that this is an instance of modal logic (also transcendental logic in his case) of how we may be able to shift from non-necessity to possibility. But this is the point: That while Badiou correctly suggests the inability to state specifics of what his communist vision — or the communist vision — is all about (as it is what is striven for without knowledge of specifics), he hampers his thought by insisting on the communist vision being dependent on a transcendent-ontologism of the Idea of communism. This too, as Badiou himself also shows, creates a heteronomous situation where it is not autonomy but our reacting to the mystical intervention and rupture of this Idea into a timeline that determines the continued influence and march towards this Eternal Idea. This is not so much a plan for action but one of impotence (instead of acting autonomously via PPR as expressed by revcon). This is not to downplay in any way Badiou’s own contributions as an activist; rather it is to make clear that despite his actual contributions to some form of revolutionary work, his ideas regrettably do not do his or anyone else’s genuine efforts for change any good. And a number of things arise that must be examined. First, Badiou tries to extend his mode of analysis from three-dimensions (3D) to a fourth (4D) by his claims of historical moments being expressed through transcendent ahistorical interventions of the Idea of communism. He also seems to model his idea on a quantum physics metaphor where time appears as an extra dimension. Badiou’s historicity seems to be an expression of the 4D aspect of an ahistorical Idea being injected into a timeline. While this attempt at multidimensionality and breaking away from the constraints of a binary system of thinking with the limitation of true/false logical constructs is to Badiou’s credit, he at best enhances the sense of aporia with its reliance on a transcendent idea of communism: Which provides no way forward other than assertions that it is progressive each time it ruptures into a timeline. The use of the transcendent idea of communism interjecting as a historical singularity simply does not explain anything. It creates a circular situation where the communist Idea breaks into a timeline as a singularity and rupture, as a historicized event, which then acquires its meaning via the transcendent idea that appears as the singularity: Back to square one. So what is this communism? Well, it is what is expressed in the event of the 1871 commune or May 1968. So what does its failure signify? That its ‘failings’ can be learnt from and avoided by getting it right. What does getting it right mean? It means representing clearer the Idea of communism which, of course, no one has a clue as to what it is. The ideals aimed for by communism in a historicized context are watered down versions of the Idea of communism; and this is entirely heteronmous in that people are to act in a revolutionary way that is supposed to best represent what this transcendent entity communism is: So there is no autonomy but reliance on the metaphysical essence of communism to solidify into and give meaning to societal structures that then, presumably, eventually wither away. It is quite didactic and does not give room for creative expression of any moral content. So when the structures wither away with the state, is that then the final historical realization of communism and is that then the end of history? The question that arises from the heteronomous-transcendent-ontology for democracy or communism is that — at some point if that fixed eternal truth is attained/materialized in a spatio-temporal moment in history, is that then the sign that our evolution also ends? As we have seen, the collapse of the USSR has nothing to do with transcendent-ontological fantasies about democracy or communism. Instead, we are at a point where capitalism is failing, and that can be understood by radical theorizing from the Quartet and can be taken as a point for opening up possibilities with revcon to embark on a continual process of growth in developing a kind of social economy grounded on morality of a people/community at any given moment in time. Thus, what may be termed the 5D aspect of revcon is not a rupture or intervention (which works on a 4D model) but a multidimensional one (that is perpetually open ended). It can bring about the change many revolutionaries aspire towards as it is lived moment to moment reflecting realities co-created by individual and collective consciousness. In fact, the commune and 1917 are instances of shifts in consciousness that are then limited by falling back into polarity mindsets of the need for there to be winners and losers; Bolsheviks and White Russians; and who lines up whom for the firing squad. These are lessons that now show us we have to change strategy in the consciousness shift. Ruptures may provide some explanation but do not guide on how to react to things collectively in a positive way. It is the theorizing that is trapped within 3D that is stuck within the polarity of being ‘ideologically right’ as opposed to that which is ‘ideologically wrong’, and shackled by a duality that precipitates conflict: Capitalism-democracy, of course, is not only defined by this but thrives on it. While communist theorizing may be interestingly viewed from a higher perspective with 4D historicity, it still presents the constant quandary of revolutions: How to make change to bring in workable ideals which seem utopian to some, but without requiring acts of violence to implement. This dilemma comes about due to limiting the multidimensional way of resolving this. Time allows for change but it does not bring into consideration the ethical dimension of things. However, this can be resolved via invoking what could be called the 5D aspect of things that comes with PPR. We then do not need grand narratives ruptured from 4D interventions into 3D which seem to always drag violence into a moment of change. We focus on PPR/revcon and its moral grounding at any given moment to bring about eventual revolutionary, but peaceful, change (as discussed later). Revcon shows that revolution is evolution. There is no fixed, eternal, immutable goal to be attained after which we then rest on our laurels. It is not utopia. To some, transcendent-ontological democracy and communism may be seen as examples of potential utopias. However, revcon and working out a process of a social economy is hard work, continual commitment and needs tremendous courage to enact for the highest good of all, and it is never ending. Badiou’s insistence of a metaphysical entity called communism is precisely the heteronomous obfuscation that creates the problems which will guarantee repeated failure of the communist project. There is insufficient argument made for the need for a moral grounding: If this is assumed in the communist Idea, then it is quite arbitrary and still does not make clear what it is that is considered the right thing in a given context. It is the kind of Idea that underlies all fundamentalisms which have sown destruction in our time. For in trying to attain an end-in-itself it produces the situation in which, yet again, the inevitable ends-justifies-the-means scenario sneaks in. Getting things right (expedience) has nothing to do with doing what is right (PPR, practical reason); and trying to resurrect an eternal idea into a context which is ever changing and shifting (historical time) and expect that it can remain constant, eternal and glorified — is quite unrealistic. This is the limitation of 4D thinking in which it provides a meta-narrative of historical intervention/rupture, but is hardly a guide to action. What we have is something reflecting philosophical form devoid of content which is meant to be filled by an eternal Idea — dependent on what the Idea allows to seep into the form (heteronomy). What we have are events like the commune fading in and out with metaphysical opacity depending on the intensities of the situation. We have an attempt at merged quantum mechanical synthetic theorizing that provides, sadly, overwrought discourse that caricatures the revolutionary drive. It is about talk and not action; rather it is about talking about action. It is also, alas, about ruminating on misplaced nostalgia mistaken for that which is progressive. It is about the good old days of 1968 rather than changing the world (though that is hoped for) – together with a loaf of bread, a jug of wine and thou, etc. 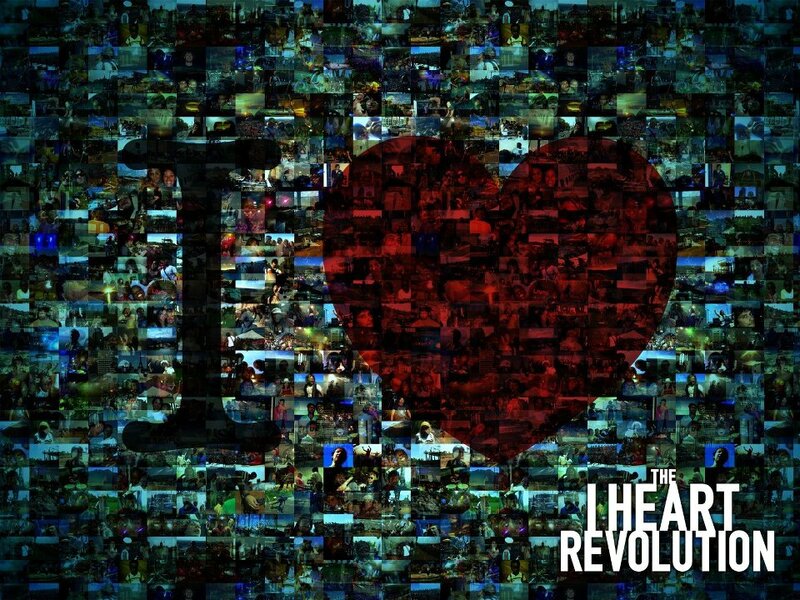 It is like listening to the Beatles’ wonderful song, “Revolution”, and think that by replaying and reimagining it repeatedly you will actually have a revolution: This belies obsession with form devoid of content: For the lyrics counter the generic notion of ‘revolution’ and ask people to free their minds instead (from ideology, hate etc). Unlike PPR and revcon which has a dynamic form that grows and progresses, Badiou’s transcendent-ontology is static. Revcon has the moral content supplied by the PPR of people projecting their consensus/consciousness into practices and societal structures that work towards co-creating a just, egalitarian, balanced, compassionate society and way of life. It is about life asserting itself for the highest good of all. 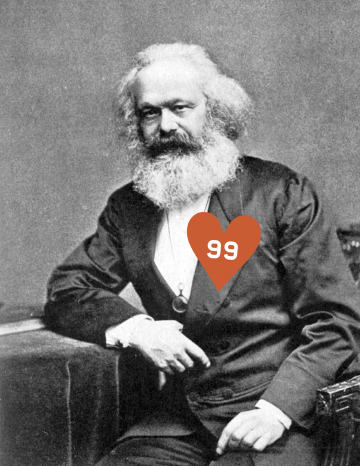 Badiou’s formulations are an expression of indulgence and focus on projecting an image of pseudo-revolutionary élan vital; it is about cleverness, rather than serving the public good: What Lenin and Trotsky would call Kautskyism for the 21st century. Together with democracy, communism is the new fetish – this, ironically, is Badiou’s achievement in his kitsch ‘little red book’ (The communist hypothesis). If there is any dynamism supported by the communist hypothesis, it is like the reflection of ahistory-history between two mirrors facing one another reflecting back and forth the light of an uncritical reason devoid of a moral underpinning. And the effect of the self-reflexive nature of the reflection comes to an end as the intensity of one’s interest fades in and out, and eventually just out, of Badiou’s discourse because we know that another world is possible, and we have to act to create it. There is no historical intervention of an eternal immutable communist Idea or any other Idea waiting to jump into our timeline so we can have another opportunity to die on barricades. And this is the point: Badiou is never clear on how his ideals or communist Idea can be created, for there is no constructivist account but a mystical one of transcendence, ontologism, ruptures, events, singularities etc which is a modern uptake of some kind of quantum Hegelianism — this may make for interesting theorizing, but is hardly a way forward. It is akin to a Nietzschean eternal recurrence which one is supposed to wear as a badge of honour the destined and perpetual failure of the communist enterprise. For as long as this fetishized Idea of communism is clung to, there will indeed be this eternal recurrence of wistful and romanticized failure time and time again. This is what this nostalgia for communism is about: Not liberation and the fulfillment of its ideals in whatever form it needs to take in our time, but to perpetually reach and play out this moment in time where you wave Badiou’s little red book and imagine modalities of better worlds. Badiou’s static and recurrent heteronomy will also claim that if the commune occurs again in some kind of variation (e.g. 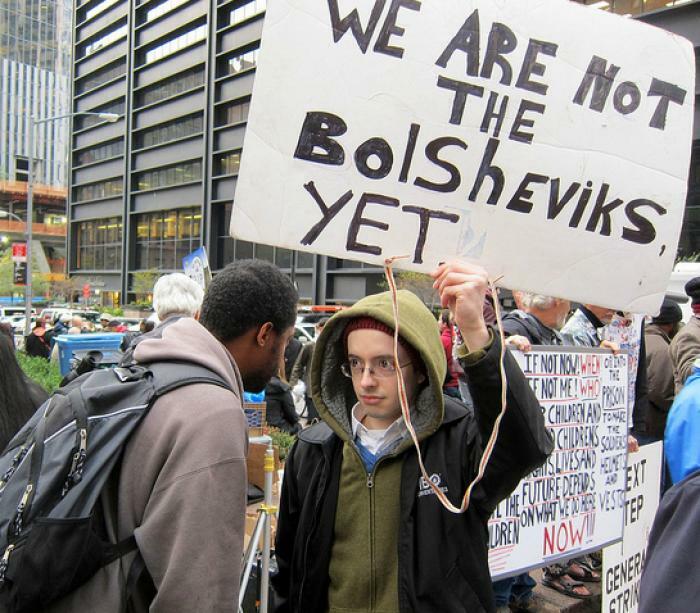 the Occupy movement), it can then be pointed out that here is another ‘rupture’ and that somehow — in a question begging way – this is communism historically expressed, for a serious attempt to challenge the status quo by the people is an expression of ahistorical communism as a singularity (whatever that is supposed to entail) of various intensities. While there are still those who champion the belief that a transcendent communism is inevitable and it must be attained/materialized as a final goal – it is something not everyone involved in, for instance, Occupy, the Arab uprisings or Eurozone protests, may believe they are heading towards. Transcendent communism is not about the autonomy of people in creating the right things; it is more about grand, eternal, fixed truths being carved in marble. There is no co-creation but the imposition of an Idea on everyone. The Idea of communism hegemonizes everyone in its overarching heteronomy. This is enslavement, not liberation. Kantian constructivism/PPR and revcon adds greater multidimensionality as it brings in the dimension of morality translated into action. This can be said to be a 5D aspect that breaks the barrier of transcendent historicity (4D) and allows focus on the current moment or Now. Revcon, therefore, sublates the limitations of Badiou by allowing for the ideas of the Quartet to be seen in their contemporary impact and precipitating a genuine opening up of possibilities. It is not about imposing an Idea. It is about being fluid, reactive and creative: For revcon is a direct expression of autonomy. The moral drive in political action, that is the essence of what the Quartet posits, is what gives revcon its force. And it represents the power of creation and rendering intelligible our acts as they are grounded on morality: As it is a creative and contextual noumenal expression at any given moment. Therefore, revcon can give intelligibility to our lives: That is why we say we have a purpose in life in doing what is right and for the highest good of all; and this is something Marxian and revolutionary ideas in general reflect with passion. It is not doing what is comfortable and expedient, nor blindly seeking martyrdom for the sake of it (the kind of thing transcendent-ontology can lead to); it is about challenging the status quo in the most radical uprooting of the dragon’s teeth that have implanted violence and conflict through the ages, and sowing instead the seeds of justice, fairness, egalitarianism, shared abundance, compassion, etc. And what are these qualities? They are what we express at any given moment, subject to constant change, of what is the right thing to do in our current context: This is constructivist action. The striving for change reflected by most revolutions, including that highlighted by Badiou, and certainly that propounded by the Quartet is understood better via revcon. The failures that occur are due to many things which include sustainability of the revolutionary enterprise. But it also includes principally the desire to see an end result and specific goals achieved to ascertain that the revolution is ‘succeeding’. This is the biggest pitfall that moves a people out of moral centredness to materially obsessed plans and goal centredness that inevitably leads to the rationalizing bed of Procrustes that chops off loose ends, and whatever does not fit into the template of checklists and performance indicators. It is understandable why there are five year plans, but they are the death knell of revolutions — the Russian one is a classic example. It is easy in hindsight to say what could be avoided, but that is our point in time now where we can learn and grow away from the heteronomous fear based ideas of the past. It is fear and the lust for the tangible (including money in hand) that insists on measurable outcomes to justify and rationalize acts of moral courage. The point about autonomy engendered by revcon has nothing to do with setting up an alternative government that goes on to repeat the same shenanigans as the one it overthrew: It is about simply doing what is right for the highest interests of all, come what may. There is no measurement that can capture the acts from revcon as they are beyond calculation and immeasurable. Are those who lead difficult lives to promote human rights and dignity, and seem not to be materially successful, therefore, failures? Is the life of a Thoreau, a failure? Are the lives of the Quartet, failures? We are at a time where sustained revcon can bring about the structures of support as we can now see without a doubt that the old paradigm is finished. It is also about trying to work out a ground-up consensus that gives us the principles of creating a broad based social economy that does not need ideological labels of socialism or communism or anarchism. At some point we may find that we can finally dispense with states and their apparatus, and we may be able to exercise the maxim of ‘each giving according to his abilities, and each receiving according to his needs’. And these are principles and maxims that are not fixed eternal truths basking in transcendence, but that which can be adjusted depending on the moral judgement of the moment as accepted in any given context. This is not expedience for it is about resisting comfort zones and changing for the highest good of all as part of a process in reciprocity and shared responsibility. Adapting what Rawls would call reflective equilibrium we have a fluid constructing of dynamic and workable scenarios, where people have decided — with or without governments — to do what is right. Over time, as this becomes an ingrained process it will reflect outwards; this will inevitably lead to the withering away of states as people power and empowered communities take centre stage. This is hardly utopian but that which can be constructed. It has no end goal but is an evolutionary process. Nor does this process halt when there is indeed some form of withering away of the state. There are no ends-justified-means scenarios but a constant enactment of what is best for all. It is not about creating perfection everywhere but the quest for doing the right things; it never ends, it is never static, it is never complete: It is always improving. 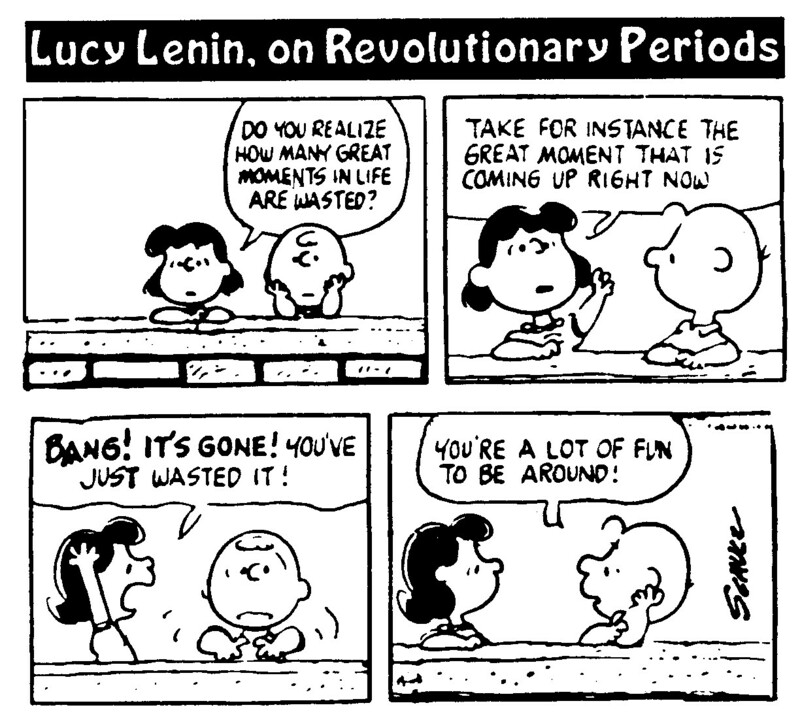 (It should be noted: This is not the same thing as the Marxian/Trotskyist notion of ‘permanent revolution’). The revcon emerging from the Quartet is an example of ideas in action. They clearly are expressions that unequivocally indicate that another (better) world is possible, and that there is a moral purpose to the ideas being enacted; that there is a moral purpose to life; and that there is a moral purpose to the world. No proponent of change for a better world for life on earth can be grounded on anything but the highest good of all. It cannot deny implicitly, even if it tries to tango around it explicitly, that there is a spiritual and moral purpose to the universe. Religious dogma and ideological obsessions may indeed be opiates for many, but revcon is driven by spiritual fervour. It is not an intellectual exercise of abandonment of free will to the rupture in history of fundamentalist transcendent Ideas. It is about the freedom to choose, bear responsibility for choices, and co-create results for the betterment of all. Indeed, revcon underlies genuine revolutionary thinking and the ideas of the Quartet. In this sense, there never is an ‘after the revolution’: For the revolution can never end, as there are no limits to human self-improvement. What can ever be the limit to being fair or compassionate? There are only different, more creative and powerful ways to express this. It is about changing consciousness. The Quartet explicitly claim the need to inculcate and realize a revolutionary consciousness. And it is clear that as the progress towards a better world via revcon is made, a trend towards unity consciousness is to be developed for that is what brings about the autonomy and solidarity of new communities and an evolving ethos. That is why Kant’s critique of pure reason, practical reason and judgement dwell so much on seemingly mental phenomena, for it actually deals with consciousness. The understanding we are supposed to gain of logical and synthetic processes of the mind reveal its creative nature: For it puts forward synthetic ideas fused with transcendental logic. It can also show how our moral understanding and acts operate as an expression of our authenticity and autonomy. Kant’s Copernican revolution in philosophy is a paradigm shift that shows that action resides not outside of us or in abstract ideas, but within – as expressed by the creative nature of our consciousness. Practical political reason and revcon, in particular, is the precise emanation of moral synergy at individual-collective level enacting and taking form in socio-politico-economic structures. The structures of our world can affect our thinking, and our thinking is also the source for changing those structures for they are an expression of our collective acceptance of those structures as real. Revcon is the quest for unity consciousness and co-creating from it. It is an open ended process that is not meant to have a specific result except a never ending evolution towards the realization of our highest good as a species in harmony with our planet. The Arab uprisings, Occupy, and anti-austerity protests in Europe can be seen as ruptures of various kinds via Badiou’s worldview and an intervention in history of the ahistorical Idea of communism. Again, it may make interesting reading for some but showing a practical way forward of theory and action is not once of its strengths. And so, focusing on the Occupy phenomena, we should see that it is not an Idealized entity creepily manifesting itself into the world; it is an instance of ideas in action; it can be viewed as revcon at work. The growing momentum of Occupy could be said to receive its first inspirations arising from the fallout of financial/economic crises of the subprime debacle, but sparked into life by the Arab revolution: It is an example of what Lenin terms ground energy (stikhiinyi). This ground energy has arisen as there is a shared consciousness of wanting change that has also learnt from failures of past revolutions, as in the 1871 commune, 1917, or May 1968. It is not a transcendent-ontological entity erupting like a boil on the scene (though its detractors may think otherwise). 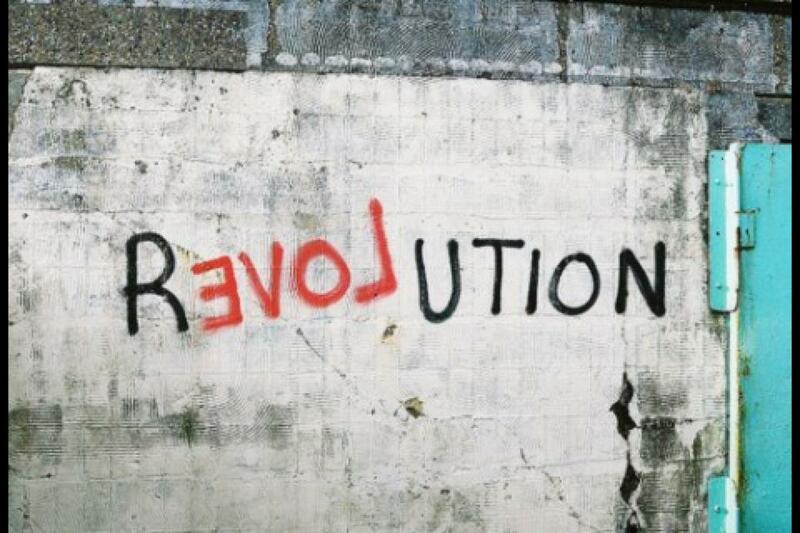 It could be said that in Occupy’s shared social DNA there is factored in the perceived failures of revolutions past. This time the idea of non-violent resistance and the ‘dropping out’ from the 1960s communal living is shaping up to a new social ecology for the 21st century. Gone are the dope and dubious mores; it is a disciplined and less than amorphous ever evolving social uprising that helps focus the will and consciousness of the 99%. This is as close as you get, for now, to unity consciousness. The 1% is not indicative of members of the state apparatus who are generically regarded as part of the 99%. The super-minority (1% ) is the mega wealthy class who are deemed largely to be part of the cause (together with political mismanagement) of the economic problems that help precipitate the unbridgeable inequalities of obscene income gaps. Revcon helps rationalize the seemingly intuitive functioning of Occupy as its participants are acting out a process of doing what they believe and know to be right for the highest good of all. In effect, it is a non-hierarchical process where singular and collective leadership is expressed through a form of fluid group dynamics. Occupy is creating along the way its own form of providing, though limited at the moment, food, clothing, shelter, medical aid, artistic expression, spiritual practice and keeping up a commitment in trying to do the right thing: This could well lead to the needed sparks in creating the flame for a new kind of revolution that has evolved away from the barricades and violence. This time, there is no need for a dictatorship of a proletariat to counter the dictatorship of democracy as manifested by a global plutocracy. Occupy is a process of not relying on overt guidance or rules or trying to model itself on any organizations nor on other revolutions as such – this helps ensure freedom from ideological heteronomy. In going with its instincts of the moment and doing what it senses is right, it is a broad expression of revcon and is devoid of a fixed goal other than doing what needs to be done to see a change in societal consciousness, and the creation of the right structures reflecting this in society. It is a proto-revolutionary process in the making. 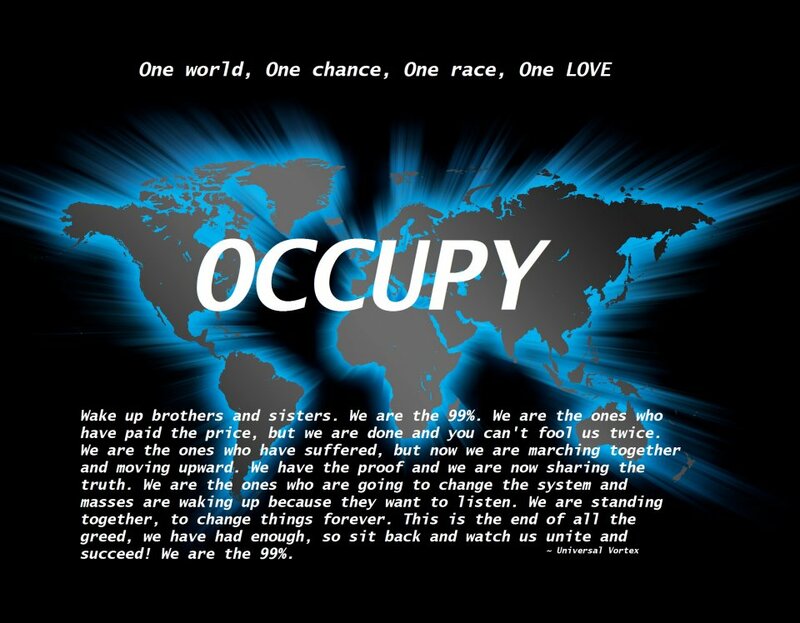 Occupy is also not an end-in-itself: It may well be a never ending process; it is also seen by some already as an ongoing revolution to shift consciousness to a higher paradigm. It is not about dual government and setting up a separate system of hierarchy or control. That will elicit the kind of resistance that can lead to acts of sporadic violence. It will detract from its non-violent character. Through what it does in using the social media, new communication technology and word of mouth, in spreading its message through peaceful sit-ins and protests, Occupy is a paragon of active non-violence. In just being itself, and trying to have an economic and social support system of its own, Occupy will be one form of people power that provides an alternative to the collapsing capitalist paradigm. If it starts to have its own local currency and encourage the use of complementary currencies elsewhere, together with the national currency, it will be starting an alternate economic energy chain that may possibly help create a new flow of goods and services. In creating connections with small enterprises and local food producers, it can start a chain-reaction of serving community interests and encourage others to join in this endeavour. It will facilitate and propel further a change in consciousness of people wherein we will be able to work and serve on smaller scales rather than larger national ones as a bloc. This takes the human energy grid out of the federal system and it will before long lead to the growing away from the state structure and apparatus. As long as we do not give our energy to old and failing structures, those structures will shrivel and fall away. These changes alone will begin to tangibly show that another and better world is possible. We do no need modal logic to explain this — we can create it for ourselves. The point here is not to worry about what happens next at the federal and national level. This concern and worry is what will cause set-backs. Put aside the excessive synthetic theorizing and go for what the heart and moral consciousness tells you to do. Things will start to fall into place. Rather than make fearful and apocalyptic projections that change may only come about with a destructive final collapse of oppressive state and capitalist structures and their apparatus, focus on what happens in the moment and take it from there. 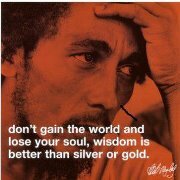 Indeed, this is easier said than done. But we have always mired ourselves with excessive rationalization and worrying and what good has that ever done anyone in the end other than create the mess around us. While revcon does not aim for a set of objectives or goals, there may be some miniature benchmarks as one goes along; but there is no goal such as the overthrow of the state or capitalist system. Aiming for these goals is what makes efforts for change heteronomous, and that is what contributed to the failure of many previous revolutions – for situations arise where ends (meeting of goals) justify the means and the whole sequence of events as we have known them, will repeat again within the context of our time. But we cannot avoid the natural questions that arise: Where do we go from here, and what happens next. These are valid questions on direction and sustainability. The responses to such questions would be to continue to do what is deemed the right thing as part of active non-violence and thereby spread influence, and so change as many mindsets as possible. This will eventually bring in those on the edges of Occupy, who think they are leading a ‘normal’ life serving failing capitalist structures, and this will also eventually bring in the support of the security forces. This will lead to a natural separation of those who choose to see themselves as the 1% (who are truly a minority) and desire to continue in that repressive role, and those of us who will experiment and try an alternative way of life in harmony with one another and the world around us (as best we can). But in building towards a unity consciousness, we also must be open to accepting back the 1%. That may be seen as indicative of our social evolution in the right direction. Occupy needs to just be and create in the moment and live in the Now. In this way, even when details at present cannot be presented: It will create and invent the support structures it needs and will sustain itself. It needs to continue and evolve and not become a formal movement. Occupy needs to be a state of mind centred on the heart; it needs to exercise autonomy in not trying to fulfill 5-year plans; it needs to exist as a moral force translated into a life form and genuine expression of active non-violence. Through just being Occupy will harness and channel the collective consciousness and good will from the heart space of each participant towards the betterment of all. This is a spiritual act that shifts the paradigm that will bring in the change that is hoped for. 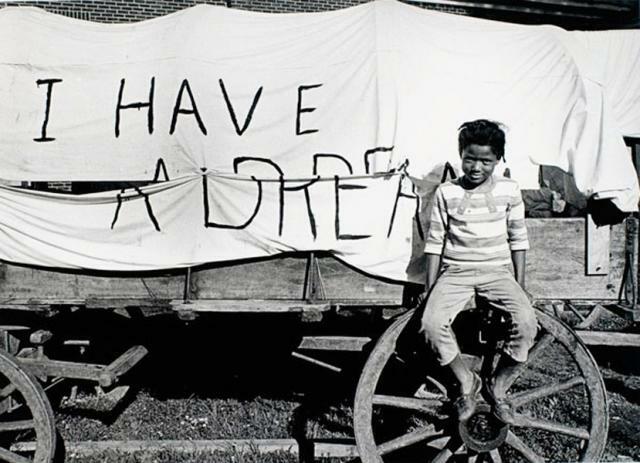 If non-violence can already bring about change, imagine continued active non-violence at a time of failing old world structures of violence and control. Occupy, through being translates noumenal moral energy in its enactment of that which is for the highest good of all as articulated through revcon. It is ever creative and always inclusive. It will inevitably attract more people and more ideas and the resources will follow. We have tried all paradigms of control and hegemony and it has only led us to where we are now. At this point of where we are at, we are not in chaos, but sublimating energies that are potentially chaotic into a disciplined expression of moral creativity that will come to be seen as the signature of human potential realizing itself in its highest form. All the revolutions of the past have not failed if they have shown us one thing and if we learn and integrate that into Occupy and other acts of collective social being: That violence is not the answer. Any change based on violence will end in failure; and so empires too fail as they are built and sustained by violence: It is happening even as you read this. The revolutions of the past have succeeded, when we have evolved the art of revolution in our time into active non-violence; as we actively work towards cooperation, collaboration and community strength. In doing so, by being and doing what is for the highest good of all daily, we work towards creating our well-being, and in so doing we are fulfilling the role of the humans on earth, and this is that of the human being. All the revolutions of communism, quest for the withering away of the state, focus on a well-being that can only come to pass by a 5D shift in paradigm to moral centredness and acting from the moral core of our being. As Kant says, it is the moral grounding of practical reason that gives intelligibility to us and the world we live. It is the moral grounding of PPR and revcon that gives intelligibility to the new structures we are co-creating. For Kant, leading a reasonable life or a life of reason as a human being means being guided by practical reason (and PPR). This would be an expression of the moral grounding of existence that all have access to by being themselves working towards the highest interests of everyone, thereby securing their own interests (which does not have to be a goal in itself). A life of reason for Kant is a life of moral strength. Occupy becomes an act of revolutionary change through being what it is and going where it believes it must in its evolutionary path. 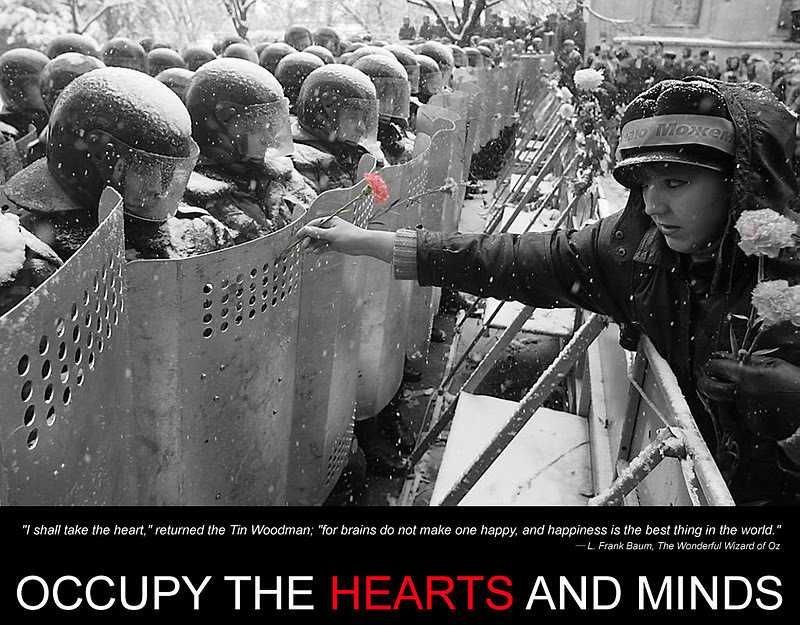 As Occupy takes over public spaces, it must take over the most important place of all — the heart space. We need to unlearn many things we have been indoctrinated into and one of the most difficult is of letting go of what the mind tells us in terms of excess rationalizing and the fear it generates from its sense of limitation: For after all, what it cannot understand or cannot project as a scenario that can be subject to tangible measurements turns into uncertainty and thereby fear. That is how we have been controlled for ages as we have trusted the calculus of various measurements to gauge success, and the most destructive form of that has been the belief that life and what is good can be measured by money. It is also the calculus that leads to separation of people and nations and the disunity amongst us that allows us to be controlled. Without war and profit mongering, people cannot be controlled; that is why the last vestiges of the 1% are in desperate attempts to keep conflict going (by emphasizing our differences as people), and keeping the obscene faith in valueless paper money and debased coins. Let us state the obvious: When there is fear, there is control exerted by others over the fearful. It is the ancient way of hegemony. We know its outcome now in all its permutations and combinations. It is time to learn and grow away from this; let the structures of control wither away peacefully. What is needed is that which is true daring and courage: And this is actually the moral courage of revcon that emanates from the true revolutionaries who enact change not knowing the outcome but that it will be positive as long things are done for the highest good of all. So in this sense, it is time to let the heart lead and the mind take a back seat. The mind theorizes and presents various options and tries to understand much of what it simply cannot. But the heart knows what is right and through revcon and the moral drive instigates acts of moral courage, and this brings about positive change. The mind leads philosophy, but the heart brings about change. A change in mind is to change a perspective. A change in heart is to make a radical/fundamental change in oneself. The two combined together, heart and mind, in synchronicity — with the backing of moral force – may well be invincible as a way of moving forward for society. It is time to experiment and let the heart lead more than the mind to regain our balance. These words written here are processed by the mind, but it is also meant to be tested for resonance with the heart. For as we know quite well by now: Philosophers have always interpreted the world in various ways but the point, more than ever now, is to change it.